Lake Superior Day welcomes the Norwegian Tall Ship Sorlandet. at Thunder Bay’s Pool 6 Cruise Ship Dock to accommodate the tall ship on Sunday, July 21 from 10 am to 5 pm. Sorlandet is based in the community of Lunenburg, Nova Scotia. 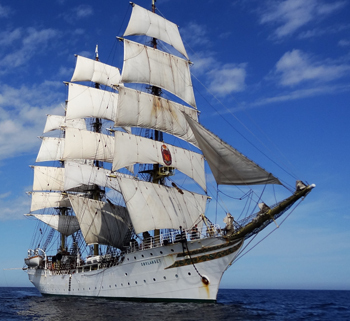 For nine months at a time, students live, study, sail and stand watch aboard the Sorlandet. The vessel travels through the Mediterranean, down the coast of Africa across to Brazil, and up through the Caribbean back to Nova Scotia. During Lake Superior Day the Sorlandet will be available for public on deck tours with admission of $3 a person, free for children under 3 years of age. It's a rare chance to catch a glimpse; step aboard, and even set sail on some of the grandest ships of yore, July 25- July 29, 2013. In addition to on board tours, Tall Ships® Duluth 2013 will offer the opportunity for visitors to sail on Lake Superior aboard the Privateer Lynx, S/V Denis Sullivan and the Schooner Hindu. Each vessel will sail several times daily beginning Friday, July 26, providing not only an educational glimpse into daily life aboard a tall ship, but also the grandeur of experiencing Lake Superior under sail.